Depending on your fitness level, the thought of getting into (or back into) a yoga routine can feel slightly intimidating. The truth is, our bodies do change as we age. Starting a yoga routine later on in life may very well require adjustments and modifications, and that’s okay. These Yoga Tips for Women Over 50 will make you feel more comfortable easing back into a yoga practice. Vedic yoga is the oldest form of yoga. It teaches that yoga after 50 is a time to move inward; a time to practice meditation and breathwork. It’s no longer meant to be incredibly strenuous. 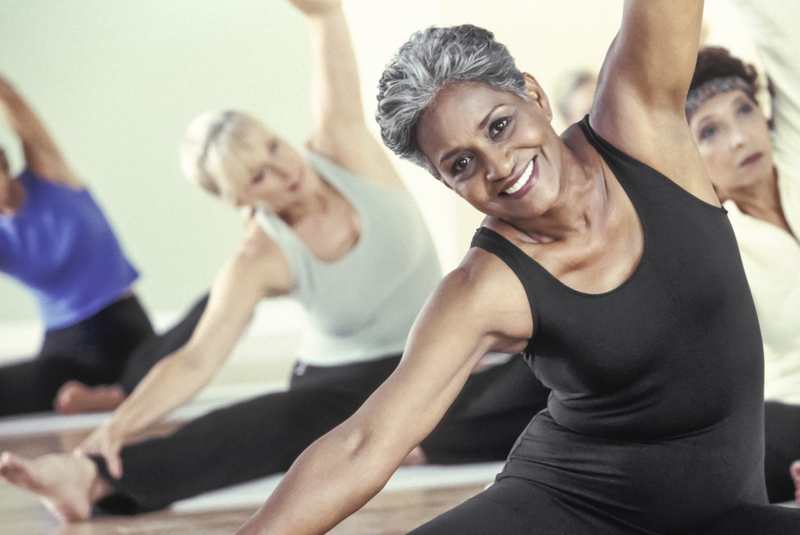 Practicing yoga as we age can keep us feeling young and vibrant. It’s never too late to begin, but it is always recommended that you speak with your doctor, first. Chances are, he or she will tell you to go for it, as yoga has so many benefits to offer the aging body! A warm-up is a crucial part of any exercise regimen, no matter what age you are. It’s even more important for older bodies, as joints are typically stiffer and take longer to relax. Going directly into performing a yoga routine without warming up puts you at an increased risk of injury. Many women are intimidated at the thought of going to a Yoga class for the very first time. While you shouldn’t let that stop you, it does happen. To make yourself feel more comfortable, practice some of the most basic yoga moves at home. You can even read up on some of the commonly used terms to make yourself more familiar with them. Familiarizing yourself with the basic moves and terms, can make your first class experience more enjoyable. In order to find a class in your area that will work for you, there are a few things you can do. First, assuming they are around the same fitness level, ask your friends if they attend any yoga classes. If they do, find out where they practice and join them. It’s also a good idea to explore your own body if you’re uncertain of your physical capabilities. Circle your joints, starting with your ankles, moving up to your knees, and then to your hips, shoulders, neck, and wrists. Gently stretch your muscles, and perform light bodyweight movements like a chair squat. This will allow you to see what’s tight, open, or requires extra attention. Once you know these things, you’ll be able to look for a class that is right for you. Lastly, more and more fitness centers are offering yoga classes. You could always speak to the front desk at your local gym to see if they offer any that would work for you. The last thing that you want is to walk into a class that is too advanced and challenging. Easing your way into yoga is the best way to avoid injury. If you have any special physical needs or injuries, it’s a good idea to head to class a few minutes early to inform your instructor. This will allow them to modify any moves to help you get the most out of the class. It will also keep you from trying to keep up and possibly injuring yourself. Yoga instructors are there primarily to make sure you practice correct form. They’ll appreciate knowing about any special physical needs, beforehand. 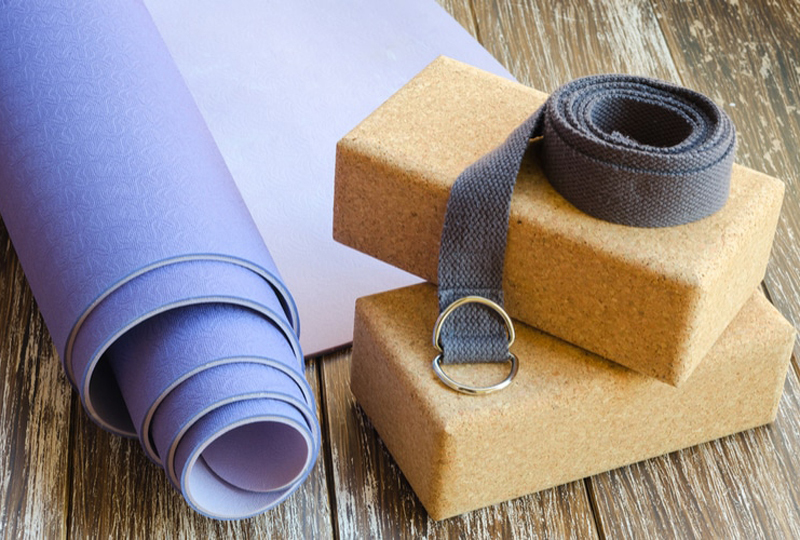 There are a few items that we highly recommend you pick up before you get back into your yoga routine. While they are not necessary, they will definitely make you more comfortable. Yoga Mat with Carrying Strap – Aside from hygienic reasons, having your own mat will remind you to practice yoga whether you’re at class or at home. Top-Rated Yoga Pants – These pants have received thousands of positive, 5-star reviews. They are durable, comfortable, and guaranteed not to be see-through. Having a good pair of Yoga pants will allow you to move more freely, getting the most out of the routine. After you’ve attended a class or two, you may begin to realize that all of the moves do not come as easily as they once did. Once you understand proper movement and form, its simply a matter of training your body. There’s no better way to train yourself then to practice, practice, practice! Before you know it, you’ll be a Yoga master!